Railroad cars are big, heavy, and cumbersome. They’re notoriously hard to move into new locations off of their tracks, and because of their odd shape most people wouldn’t think of using them for anything else anyway. But in the spirit of recycling, green construction and shipping container homes, some enterprising people are recycling old train cars into homes, offices and even hotels. 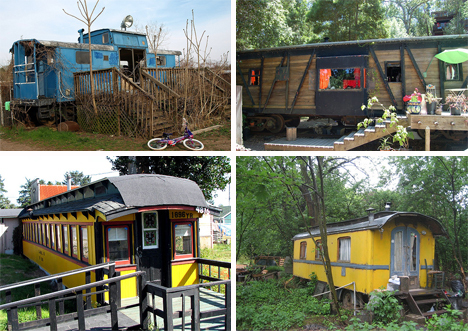 With the mortgage industry in trouble and more people making the shift toward green housing, reusing train cars as homes is a logical step. Like shipping containers, it’s relatively easy to do the conversion yourself, provided you have the resources to get the car to its new location. Cabooses seem to be the most popular choice for train car homes, but there are plenty of dining and sleeping cars being converted as well. If you’re able to shell out between $8000 and $45,000 for an old car, another several thousand to transport the car and put it into place on your property, and whatever it takes in material and labor to transform it, you can have a home for much less than a conventional house would cost. And best of all, it will be completely unique and as green as you want it to be. This converted rail car home in Portland, Oregon, is a great example of how beautiful a home a converted railroad car can make. The outside may look plain, but on the inside it’s surprisingly luxurious. The home encompasses an impressive 807 square feet and features 10-foot-high ceilings, DSL, thoroughly new everything, a full electric kitchen, and an incinerator toilet. The siding it’s currently situation on is rented to the current owner for $150 a month, and since it’s not technically real estate there are no property taxes. 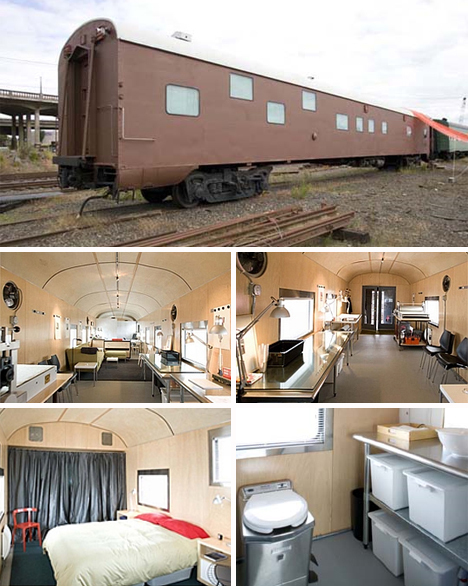 The home is currently for sale, so if you want the train car home experience without renovating one yourself, now’s your chance. If you’ve ever passed by the northern edge of Richardson Bay in Sausalito, California, chances are you’ve seen some pretty unusual houseboats moored there. One of the most unique is this one, made from an old railroad car. The car was once known as #41 on the San Francisco and Northern Pacific Railway in 1889. After it was retired in 1936, it was made into a land-based duplex and stayed put until 1979. At that time it was purchased to be made into this amazing houseboat. The home contains many of the original rail car bits, including the dining seats and some of the interior wood. 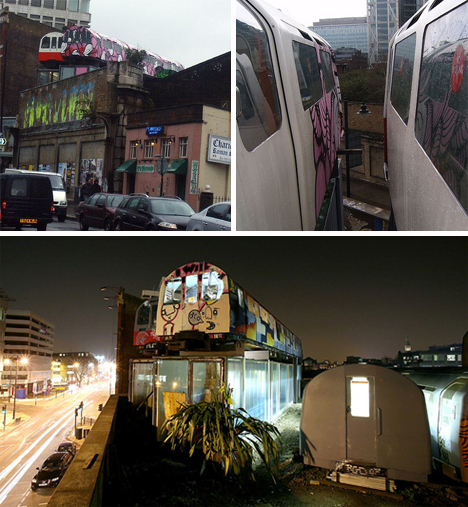 High above the London streets in Shoreditch, a few disused Tube carriages sit proudly, adorned with beautiful graffiti and shining with new life. They’re part of Village Underground, a collection of office and studio spaces that encompass the carriages above as well as a massive Victorian warehouse below. A wide variety of occupants take up the spaces, making a truly diverse and unique urban community encompassing some very distinctive recycled building elements. 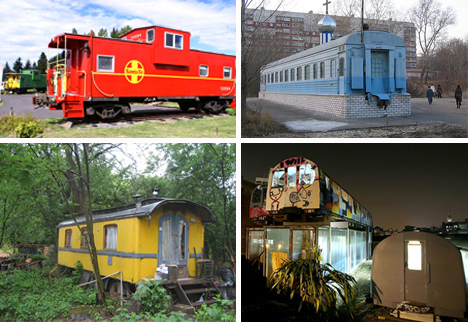 Not all repurposed train cars are used as dwellings or offices. Sometimes, it’s simply a matter of using the available material to solve the problem at hand. Though it’s not clear exactly where this train car bridge is or even how it got there – miles away from a highway or railroad network – it’s an amusing sight. 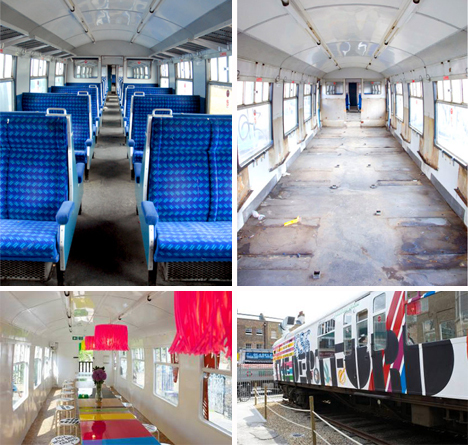 In mid-2008, a remarkable project came together in Deptford, South London: a 1960s rail car was transported to the high street to become part of an urban reclamation arts project. The car was stripped and repurposed by designer Morag Myerscough, then turned into a café. The Deptford Project Café is now decorated with beautiful graffiti advertising its existence, and inside you can get a cup of sustainably-harvested coffee or a plate of locally produced treats. 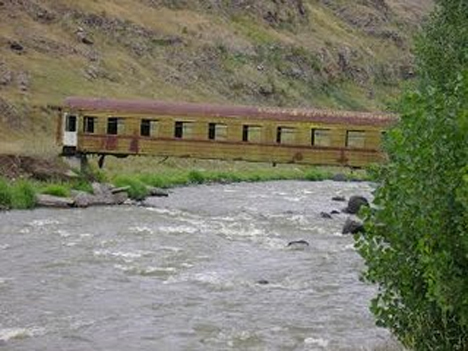 Some enterprising individuals put the homey feel of converted rail cars to good use as bed and breakfast rooms. The Redcaboose Getaway on Washington’s Olympic Peninsula manages to look both charming and exciting. If you ever wanted to be a train conductor as a kid, this is the place to live out that dream…sort of. 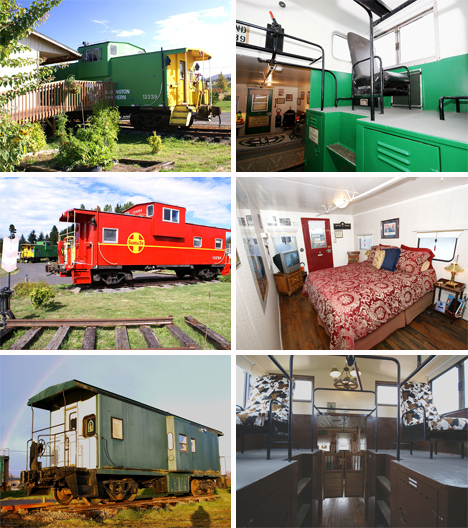 The B&B features several cabooses, each of which is a separate guest chamber. There’s also a restored art deco dining car where the staff chef prepares breakfast each morning. The Olympic Peninsula is one of the must-see areas of the US, and this seems like an amazing place to call a temporary home while exploring the area. The Controversy B&B in Hoogwoud, Netherlands takes full advantage of the offbeat nature of the discarded train on its grounds. 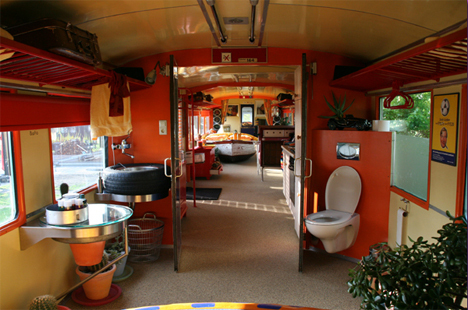 The compartment is 21 meters long and contains some truly wacky features: the sink basin in the bathroom is an old tire, the bed is a boat, and the jacuzzi tub is in the shape of a colorful sombrero. And if trains aren’t your thing, the transportation-themed property also features trams and a UFO. 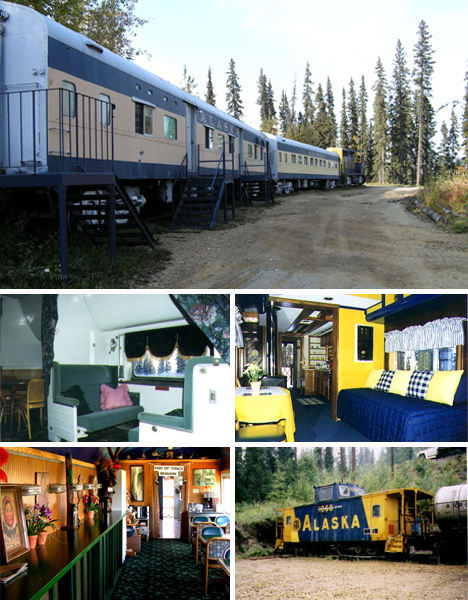 Fairbanks, Alaska boasts its own quirky railroad car bed and breakfast. The Aurora Express B&B features four historic railroad cars as sleeping chambers and one dining car. The cars were purchased from the Denali State Park Hotel for $1 each, with the agreement that the Wilson family would pay to transport them to their property. Today, the cars sit on 700 feet of private railroad track overlooking Fairbanks and the Tanana Valley. 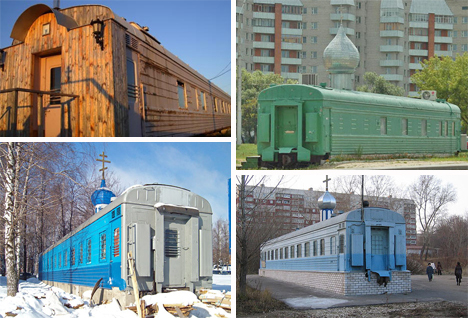 Perhaps the most bizarre train reuse is the Russian trend of converting old train cars into Orthodox Christian churches. They range from the simple repurposing to the elaborate redesign, complete with adding an entirely new facade. The end result is an unusual but inspirational presentation, showing us that these industrial giants don’t need to be discarded when their working lives are over; they simply need someone who cares enough to give them new life.